"I've just watched the nearest thing to a Brazilian footballer you are ever likely to see - and he comes from Lewisham." - David Dein, on seeing David Rocastle play. I'm probably the last person to whom you would go to ask what it was like seeing David Rocastle play. After all, I'm an American who only started following Arsenal in 1997, and though Rocky was still an active player in England at that time, football was a very new world to me then, and I was absorbing so much about the sport and Arsenal in general. My Arsenal heroes in those early days were Dennis Bergkamp, Tony Adams, Patrick Vieira. I was still becoming acquainted with the heroes of the present, I hadn't yet had a proper introduction to the heroes of the past. If I'm honest, the first time I'd heard Rocky's name mentioned was in 1998 while watching the film Fever Pitch. It was on ITV in the flat I shared with four other students in Edinburgh, and even then his name didn't register as terribly significant, being that nearly every player on that 1989 team was mentioned in the movie at one point or another. Even attending my first match that December at Highbury (a 3-1 win over Leeds Utd), though there seemed to be images everywhere of Arsenal players of the past, I was in such a daze and a rush that there wasn't time to stop and point out as a child would and ask who this or that picture was of. I also remember trying desperately to look as though I knew what I was doing and not to embarrass myself, so any questions I might've had would have gone unasked anyway. I think I only truly became aware of how much Rocky meant to Arsenal after hearing about his passing. These were the days before Fox Soccer Channel made football accessible to the masses here in America. One had to scour the internet, still very much in its infancy, for news about your club and the Premier League in general, as well as make sure you were home when MSG network showed a sort of Match of the Day on Sunday night, where the highlights of each game were shown, and one or two matches were condensed to somehow squeeze 90 minutes into 30, and I was damn thankful for it. As always, I'd purposely avoided hearing the outcome of the match that weekend 10 years ago so I'd see the events unfold as new; and this was the North London Derby, so it was of greater importance than most matches. Also, this was my weekly fix of Arsenal, so it was something I held very sacred anyway, even if no one else I knew understood it. What I saw astounded me: a moment of silence was held, and as the camera panned around the crowd, I watched grown men weeping as though they had last a family member. And in a very real way they had. Arsenal players on the pitch that day had played alongside Rocky and had lost a brother-in-arms, the fans in the stands had lost a man who was for so many a hero, and the world had lost one of the few genuinely nice people in it. I sat there, in my parents' living room watching this outpouring of grief, feeling part of it but very much an outsider, which wasn't a feeling I had ever really associated with Arsenal. 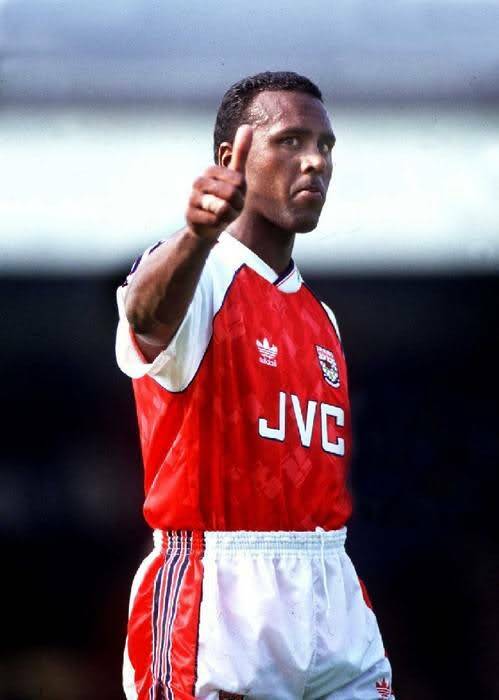 I spent the next week reading everything I could get my hands on about David Rocastle the player, David Rocastle the Arsenal legend, about David Rocastle the man. I read reminiscences of players who'd play with and against him, fans who had met him and people who respected him. While often times we tend to just bite our tongues about a person's failings in the wake of their passing, I got the feeling that when it came to Rocky, no one ever had a bad thing to say about him in the first place. He was by all accounts a gentleman in a sport too often ruled by thugs. The quote from David Dein at the top of this post, for those who saw Rocky in his prime, is not hyperbole. He was a thoughtful, creative player with tremendous close control. This was not the sort of player who tended to gel within George Graham's system of play, but the technical side was only one half of Rocky's game. He never shied from a challenge, and brought the crowd to its feet with a strong tackle as often as with skill on the ball. He was most definitely a star player before television brought English football to the wider world. If he had played today, I don't doubt that he'd be held in the same regard as Cesc, Steven Gerrard or Frank Lampard. What's more, he was living the dream of playing for his boyhood club. He was Arsenal through and through, and I think that helped form a bond between himself and the Arsenal fans that was stronger than most players ever experience. It's a bond that continues today. What is the measure of a man? For me, someone who never met David Rocastle, never saw him play, and know him only from pictures on a screen and through the remembrances of others, Rocky is many things. He's an image of what it means to play for Arsenal, the importance the shirt holds for us and what it should hold for the players. He is the standard of excellence our players should strive for on the pitch and that we should all try to achieve in our lives off of it. He is a reminder that none of us will be on this earth forever, and that while we're here we must live our lives with that urgency in mind, that we must earn our lives. He's one of the things that links me with Arsenal, as I have come to know him only through others who were able to cherish him, personally or from afar. Though I never knew you Rocky, I will most certainly miss you.